How to Recover Deleted Photos from iPhone Xs Mac/Xs/XR/X/8? Photo is one of the manners that record your life at any moment. The HD camera of Apple iPhone provides you with the ability to capture fantastic pictures and taste them slowly in the leisure times. If you love taking photos with iPhone, you may save a great number of pictures in the iPhone memory. Once the photos are deleted by accident or lost due to system updates, you may be at a loss without your memory. What's worse, iPhone doesn't have a recycle bin to store your deleted files. If you deleted photos from iPhone, you can not recover them back directly from a trash bin like doing it on a computer. Actually, the trouble of data loss on iPhone happens here and there, you're not the only sufferer. Fortunately, files deleted from iPhone will not be erased at one. The storing system will mark them as "deleted" and keep them in invisible and unaccessible place. The original place where these files occupied become blank and wait for new files coming to take over the area. We still have a big chance to recover the deleted files before they are overwritten by new data, by using professional photo recovery software for iPhone. Be attention! A professional recovery tool is the key point! Don't use a free online tool to restore data on your iPhone to avoid the original data from being damaged, or you will lose the only chance to get them back. Coolmuster Data Recovery for iPhone iPad iPod (Mac Version & Windows Version) is a special weapon specially designed for users to recover not only photos, but also contacts, call list, text messages, notes, voice memos, camera roll, etc. from iPhone Xs Mac/Xs/XR/X/8 Plus/8/7 Plus/7/6S/6. by extracting from the iTunes backup files. That's to say, as long as you have ever synced your iPhone to iTunes, the data recovery software will work without any hassle to recover your wated files swiftly and easily with a few mouse clicks. It works well with both Mac and Windows version, and recover data without any quality loss. 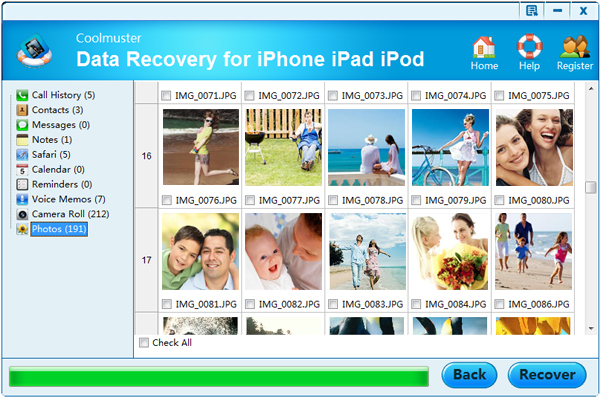 Below is the detailed steps on recovering photos from iPhone with the help of Coolmuster iPhone Photo Recovery. What if icons are missing from my iPhone device? How to Enter and Exit DFU Mode of iPhone? Tutorials: How to Retrieve Lost Photos from iPhone Xs Mac/Xs/XR/X/8/7/6 in 3 Steps? Here we set Windows version as an example. If you are using a Mac, don't worry, you can turn to the Mac Version and follow the guide below as well because the operations on Windows and Mac computers are almost the same. Install and launch the program on your PC, then, you will get an interface of the program as below. All your iTunes backup files of iOS devices will be displayed on the main interface. Just select the one of your iPhone and then hit "Start Scan" to begin to scan for files on the iDevicie. When the scan finishes, contents inside the iTunes backup for your iPhone will all be extracted and showed in categories as the image below shows. To recover photos only, you can just simply click to open the "Photos" folder and preview the contained pictures in the right panel in thumbnails. In this way, you can find the target pictures accurately and quickly. If you have selected all photos you want to restore, just press the big "Recover" button to finish the whole process. See? Only in 3 simple steps, you can achieve your goal. The functions of this iPhone photo recovery program are far more than these. You can use it to restore your files even if your iPhone is lost, missing, stolen, or water damaged. It support all models of iOS devices, including iPhone Xs Mac, iPhone Xs, iPhone XR, iPhone X, iPhone 8 Plus, iPhone 8, the new iPad, iPad 2, iPad mini, iPad 4, iPad Air, and iPod touch, iPod touch 4/5, iPod Shuffle, iPod Nano 3/4/5/6, iPod Classic, etc. All existing Windows and Mac systems can be supported by this program. Experience its powerful functions and prominent recovery speed at once.